Looking for a science fair project? Want to find a way to “wow” your family, friends, relatives, or skeptical co-workers? Not only is this a rodent-free project, but it is simple to conduct, and yields fast, dramatic results. Alyssa used hard red wheat “berries,” which are kernels that have not yet been ground into flour. 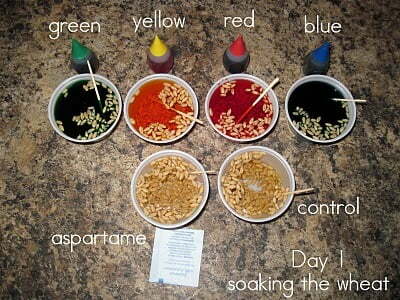 She also used liquid food coloring from the supermarket and a packet of “Equal” (aspartame). First, she soaked the wheat berries in a combination of 2 ounces of water with 10 drops of the dye in 4 of the bowls; in one bowl, she dissolved a packet of Equal (aspartame) in the water. The control wheat berries were soaked in plain water. After four hours, the water was drained off, to be used for watering the plants, and supplemented with plain water. The wheat berries were planted in regular soil. The wheat berries given plain water grew lush and strong, while the chemically-treated plants were stunted and sickly; even the root systems were dramatically different. This experiment is an eye-opener for all ages. It could be located on the window sill in your kitchen, in your child's classroom, or in your office. Anyone who believes that living things are not harmed by chemicals like this should start to question their comfortable beliefs after they see what happened to these wheat grass plants. I’m curious: do YOU notice a difference in yourself or your kids when you do or don’t avoid these additives? Our family avoids additives like these at all costs, as they result in disrupted sleep and off-the-hook behavior in our 6yo son. We home school our kids and will DEFINITELY be replicating this experiment at home. Thanks! Although I agree with your premise I am not sure this experiment really proves anything. If you put manure in the soil the plants would probably grow better, though I don’t think that would mean you would want to feed manure to your kids. Hi! This is Alyssa. I redid this project for science fair, this time with just food coloring. I soaked it longer (two days) in the food dye and observed it longer. The plants grew even worse than before. Yellow hardly grew at all. Thank you for sharing the story on your blog! One more thing, notice how the control plant in the pictures is popping right out of it’s container…that’s the amazing root growth! The gotpetroleum blog is mine and my amazing daughter is Alyssa! I wanted to let you all know that she repeated the experiment at her new school and got to go to regionals this time (received an excellent rating). We found a few new things with the second experiment. This time we used a bagged potting soil that included some nutrients and a water holding polymer. 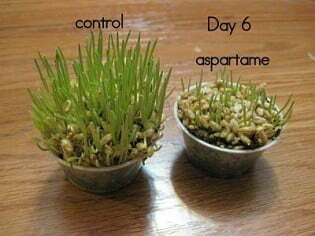 We still saw a lack of root development but the top growth didn’t have the same drastic difference. As in the first experiment the roots did not hold together and were small and spindly in the colored plants vs. the control plants with a nice root system that could be lifted out by the top growth easily. Wow. I’m SO reading that to my kids tonight… With Halloween coming and all. hi, last summer my kids brought one of their magazines to me to do a craft from it. You were to take clear glass bottles or vases, fill them with colored water and put white daisies in them. Then after a few days of sucking up the colored water they would have colored petals. (remember the celery experiment in elementary school?) The picture on the page had five or six flowers each a different color of the rainbow. I wasn’t going to buy daisies, so my husband stopped by the side of the road and picked some hardy ones that grow like weeds around here. We put them in glass vases. The colored water in one vase was pink, one orange, one yellow, one green, one blue and one purple. The pink, orange, and purple started to wilt very soon and were COMPLETELY DEAD by the THIRD day. I threw them out and kept the others. They would use up the water and I just added more water to the vases. The flowers in the yellow, green and blue vases started to wilt and died in the SIXTH WEEK! What do pink, orange and purple have in common? Red food coloring. Needless to say, we don’t eat red food coloring anymore. I told my husband’s doctor about it and he was amazed. He wanted me to repeat just the colors with red to see if it would happen again. I am going to, but haven’t yet. I posted this to my FB page, and I got one comment. He was saying that food dyes are chemically salts, so would want to see what would happen if the wheat berries were soaked in sea salt. He doubted that they would grow well. I would also like to see what would happen if they were soaked in sugar water. I’m not saying that this experiment is bad, but I think that adding these conditions would add to its validity overall. I definitely would not want to add food colorings like these to my food! This is an awesome science project. And wow! Articles like these really continue to spur me on to fight the good fight for real food. Thanks for sharing! I will be really interested to see how it goes! Our family started the Feingold Diet in July 2009. We were hoping to help our (then) 4yo DS that was on the autism spectrum and our (then) 7mo that had eczema. On day FOUR of the Feingold Diet, our 4yo DS started using the potty by himself for the first time. Prior to this he was still going #2 in pull-ups. We also noticed immediate changes in his chewing habits. Prior to the diet change, he would destroy toys, cups, and clothing with his constant chewing. Prior to the diet change, DS would wake up from naps in screaming rages that we couldn’t calm him from. Those screaming rages have ceased. We’ve had no problem with them and it’s now a year later. We’ve since moved on to more dietary changes since starting Feingold, but removing all artificials was a phenomenal first step for us! I think I might take that challenge! I could try soaking/watering with kombucha, raw honey water, and a couple other things. My thought is that it will go well. I know that when I have a kombucha-soaked towel in my house, all of the bugs go crazy over it, more so than anything else. So let’s see…when can I get new wheat berries? Along with many of the other coments, people think I’m over the edge too. This is a perfect visual for my husband as he still drinks diet soda. sigh… Thank you for posting this and for all your excellent posts. your pictures are worth a thousand words. trite but true!!!! Hum, it’s interesting but I think it’s making a lot of assumptions. It would be interesting to see how it reacted to regular sugar or honey… maybe even something like kefir. These things might also be detrimental to wheat berries, IDK. They are very different organisms than we are. That is what I wondered. I don’t think it’s a very well-conceived project. There are probably plenty of things that are healthful for human consumption that are not beneficial to wheat. 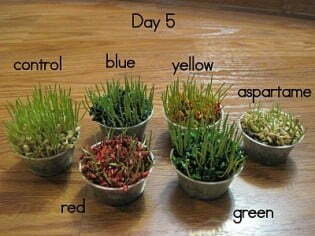 All this proves to me is that I shouldn’t put food coloring or Aspertame on my plants. It IS dramatic, and I guess that sells at school fairs. Awesome project!!!! I have a hard time breathing when I eat food colorings. my family thinks i’m over the edge too. this week my pre-k kid came home telling me he was getting one M&M as a “prize” for being quiet at nap time. I responded, oh, “so you got to eat your M&M after nap time was over?” 4yo responds “no, at nap time.” In what universe does it make sense for a kid to eat candy during nap time? seriously. I shared too. I have a lot of friends who say “I drink lots of pop, but at least it’s diet.” UGH!!! We’ll see how they like this. They’ll probably ignore it. the word to people that think food dyes really aren’t that bad. Keep your old bottles for science! Seriously, lol, we used them just yesterday for science experiments that youngest dd was leading. Very well done experiment!! 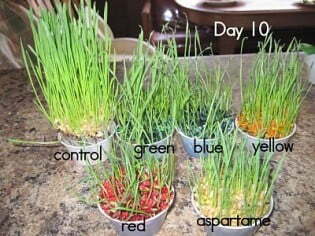 Those poor little wheat germ plants look like how I feel when I have not eaten according to my GAPS diet. I too am sharing this article! I just blogged about how residue from rinsing out bakery frosting buckets killed our grass! I couldn’t believe it and posted a picture. Dh thinks I’m over the edge 🙂 but even he was wowed by it and shook his head in disgust. BTW, we did NOT eat the frosting – I got empty ones free from the bakeries for other projects. Funny you posted about dyes and grass the next day. Wow, this is just shocking! I shared it on Facebook too. I need to show this to my kids to let them know why I want to avoid these things (we are still in the process of change. I am going to go throw out those little bottles of dye right now!!). I just facebooked this post. Just this afternoon I have been emailing with other classroom parents trying to get the teacher to change the reward system for 3rd grade multiplication facts from candy/”food” to stickers and cool erasers. Thanks for a good visual argument!